If you just wanna relax, you can use our DESIGNATED BEACH CHAIRS in a prime location at White Beach (2min walk). Enjoy DISCOUNTS at partner restaurants, dive shops and kite-surfing schools. This hostel is commendable. The staffs were all accommodating. The comfort rooms were clean, I'm impressed (first thing I check in a hotel or hostel is the comfort rooms). It feels like home away from home. We had a great stay. Definitely will recommend this hostel to my friends. It was beyond expectation. Our stay in Frendz Hostel in Boracay is one of the great memories we had in Boracay. Kudos! Staff is the best feature of this hostel. They’re very friendly and are so fun. They make sure they all introduce themselves and get to know their guests. The hostel itself is a great place to stay at and very close to the beach. Had an amazing stay here. Location is really good. Staff are very friendly and accommodating. Very clean. Atmosphere is very good. The Jungle Tour they offer is one of the best tour I had. Great and affordable place to stay. The staff were attentive and helpful. Great location. The food was good. the room was spacious and clean. Really surprised with this hostel after staying at another popular hostel for a couple days before which didn't live up to this place at all. The staff were lovely and so informative. Free pasta night on day of arrival which was pretty good, especially with a free beer too. Atmosphere friendly and plenty going on, easy to socialise and meet others. The dorm room was simple but good air con and clean. Overall, could not fault this hostel, good vibes all round! Loved our stay here! We were debating between here and Mad Monkeys, but this was so close to White Beach that we chose here. It has a great atmosphere for drinking and meeting people at night, but everyone has to leave by 10:30 so you can still get a good sleep if you need to take a night off! Free pasta night on Wednesday was a nice perk as well. Loved this hostel! Will definitely come back. A few sleepless nights from noise and the bathroom could have been better but outside of that there was a great vibe, clean and comfortable beds, and the staff are so fun and friendly!! Highly recommend! Staff are friendly, themed nights are good & get everyone together, drink prices are cheap. Rooms are a little dark and dingy, and being wood you hear and feel everyone’s footsteps but aircon is good and on all day. Rooms are clean. My only recommendation would be to make it clear what rooms are private as they all look the same. A few times I was woken up by drunk people trying to get in my room or sat outside on the deck, a little annoying when you’ve paid for privacy but nothing to cry about! The dorms are very basic and the WiFi doesn’t really work in the rooms but you could still sleep long, people are chilled. 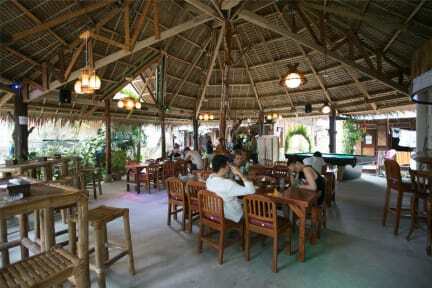 The location is good, 2 min walk to the white beach and all the restaurants. The main area is very nice and social and also the staff is so lovely, always make sure that everything is okay. It is very Party but we couldn’t Hear the music in the dorms, so it was fine. You are not able to lock your big bagpack, only small things but I would still come again when in Boracay!